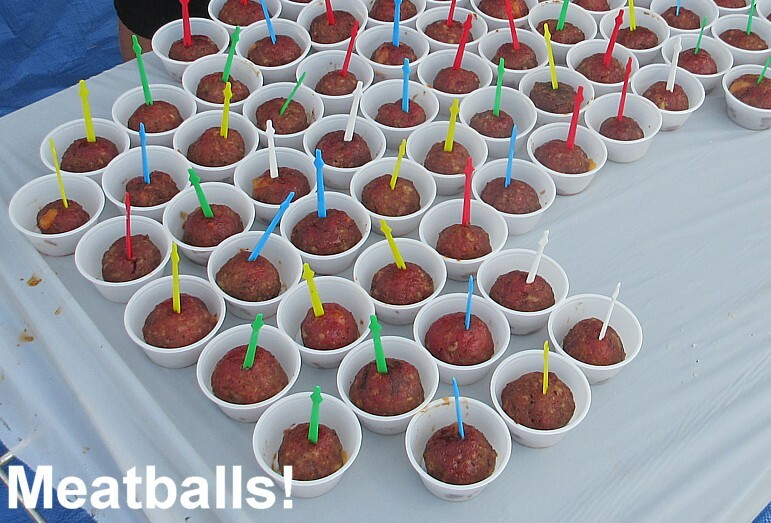 So what do you do with extra BBQ sauce? We all know if you eat good BBQ you really don't need sauce. So what do you do with the BBQ sauce you receive? Usually my Mrs mixes it in with meatloaf or uses it to baste chicken or pork. However last night I poured some over some plain rice and found it rocked as a BBQ side dish. So what do you do with the sauce when your BBQ is too good for it? 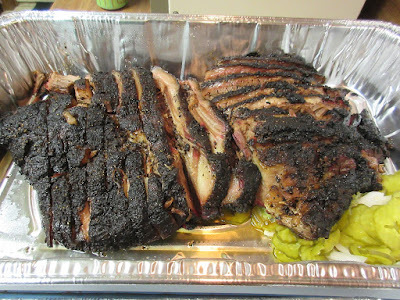 We finally finished off the 2 Pecan Lodge briskets I had purchased and frozen back in June so it was time to re-up. I got there about 11:30 am and, as usual, there was a line out the door. I bypassed the wait for the good ol' express line. I was in and out in less than 10 minutes. 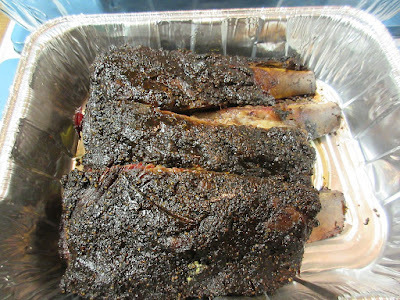 This time I added a rack of beef ribs and they were wonderful, as they always are. After I stripped off the meat I found myself gnawing on the bones to get that last little bit. 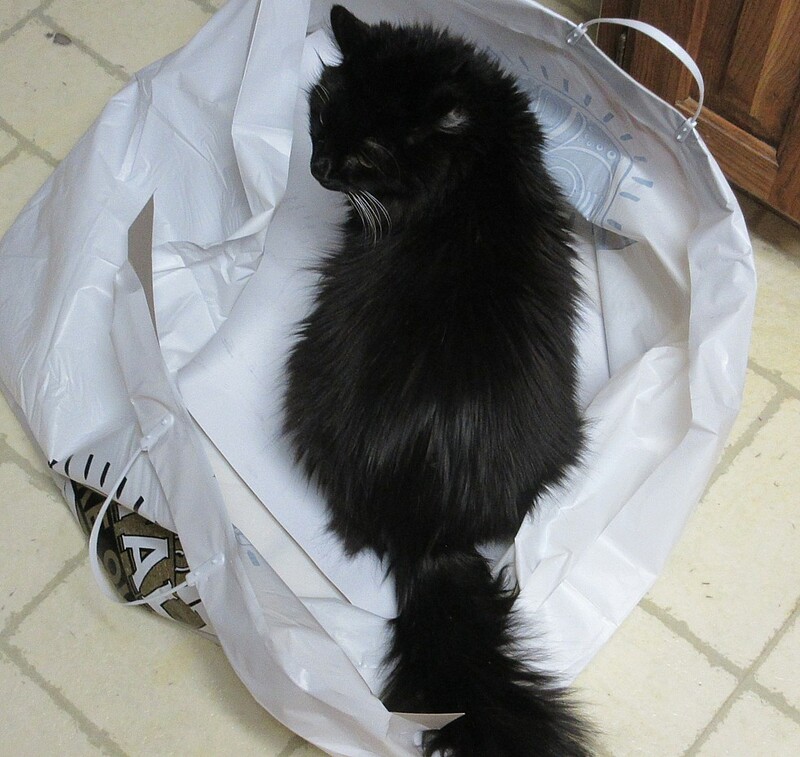 As I was splitting up and bagging the meat for the freezer, I noticed our cat had made a new home in the Pecan Lodge bag. The smell was just too much for her. Smart cat. Yes, it got a little bite of brisket. After having a very delicious lunch, the rest got put away for future happiness. The parking situation in Deep Ellum is getting stupid as the city has bagged most of the meters with No Parking signs. I have no idea what that is about but it certainly doesn't encourage visitors. Typical Dallas crap. It has been several years since I had purchased tix to this fest. My buddy Dave in Austin has done the honors the last few years since I have usually been off bass fishing when they went on sale. This year Dave was out of the country and I was not fishing so I sat patiently at my keyboard as 10 am approached. 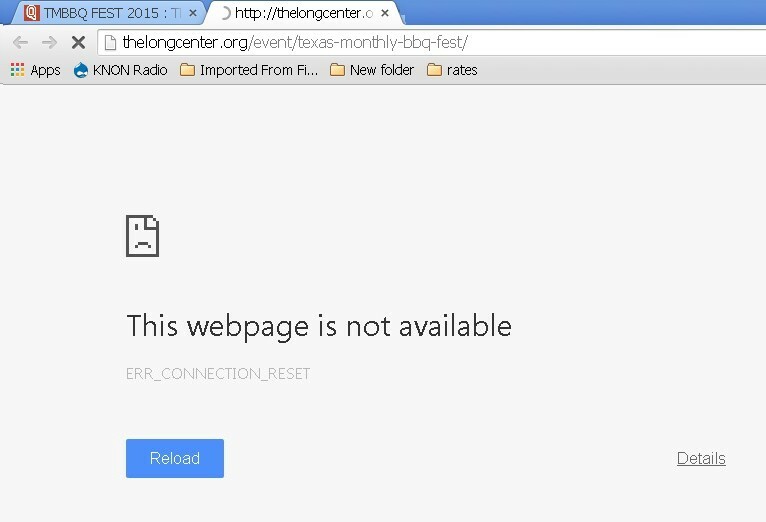 I don't know what happened, but the Long Center website was down for about 20 minutes right at 10 am when tickets were supposed to go on sale. Very frustrating to say the least. However after lots of reloads, it finally popped up and I was able to snag us 3 VIP tix. We're looking forward to another fun time in Austin. 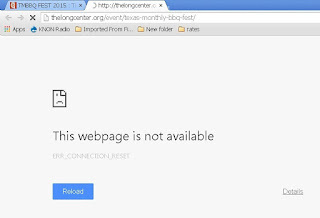 The Long Center ticket website seems to be the source of the problem. Three days later I received an e-mail telling me the print at home tickets I had received were no good due to an error and they would need to send me new ones. Then I got 2 more e-mails with "recall" in the subject line and over 70 e-mail addresses in the CC. Not cool. Finally I received a 4th e-mail with the corrected tickets. I wonder how many folks will show up with bad tickets? 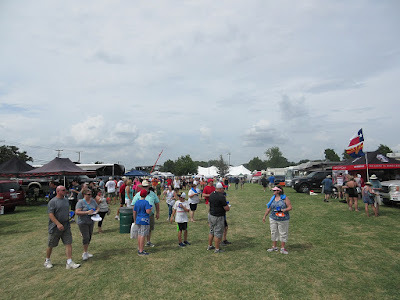 After several years of judging at the KCBS contest at this event I decided to take a break this year. 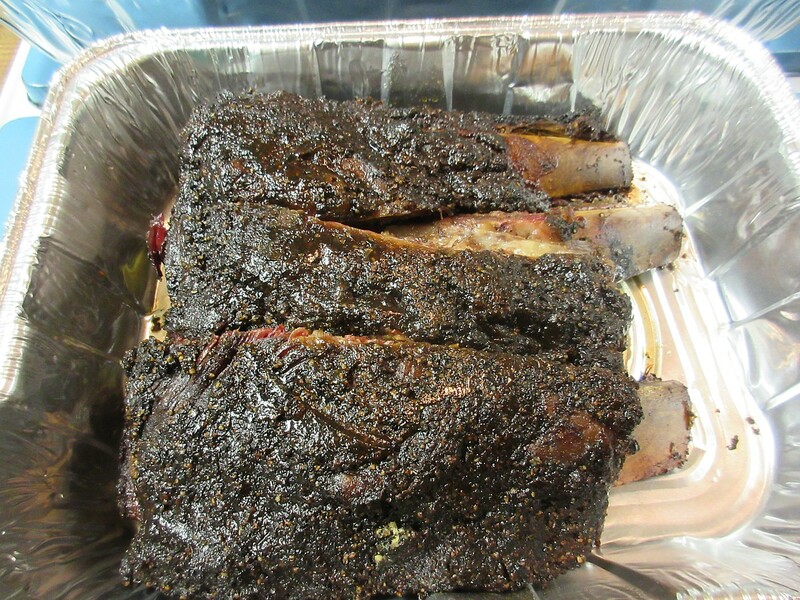 Every year KCBS has been running their judging classes. That built up the number of local judges to the point that many who showed up to judge were turned away or did other volunteer duties. I decided this year I would do the public events and give someone else the chance to judge the main event. There were 2 different public BBQ events at the fest. The first was the People's Choice event on Saturday. For $12, you got 10 tickets to visit participating cook sites. 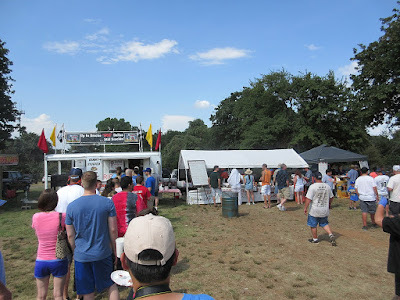 About 1/3 of the KCBS cooks were in the event. My wife and I combined our tickets and we were able to sample most of the joints. Basically you just wandered around to the different stations, identified by a small sign, and picked up samples. At the end, you gave one or both of your poker chips to those you enjoyed the most. 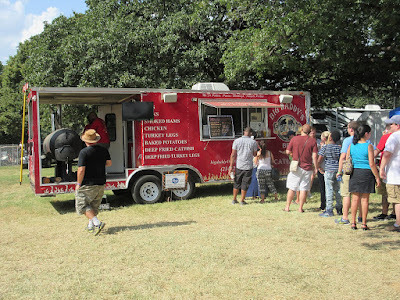 It was a far cry from the usual KCBS standards. Many were doing versions of jalapeno poppers, with cheese or meat filled peppers wrapped in bacon. 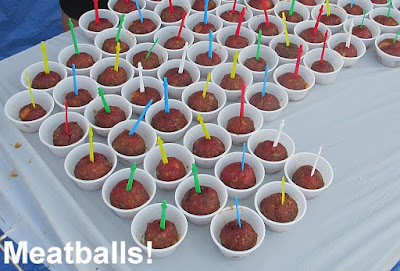 There was one cook who presented cheese filled meatballs. 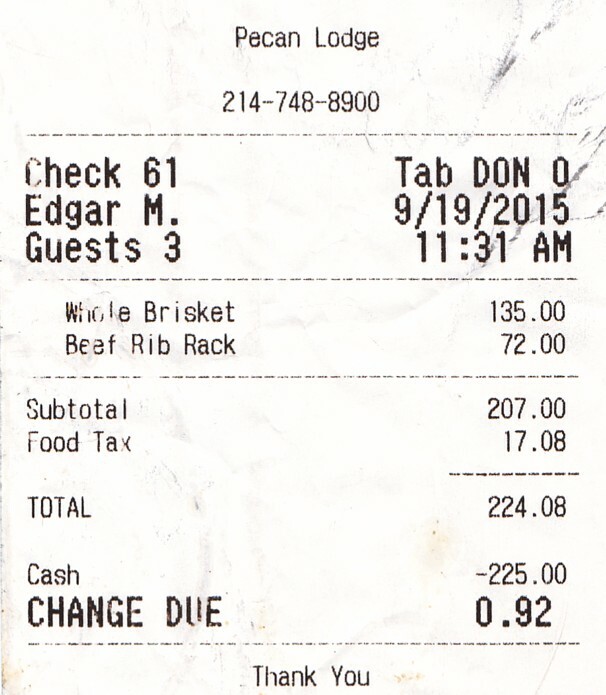 The food was all over the map but much of it I would not consider to be BBQ. Out of the 20 cooks we sampled I only found smoke flavor in one and they got my chips. 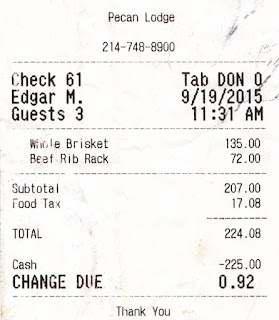 There was a lot of tasty food, though, and for $12 we definitely got our fill. 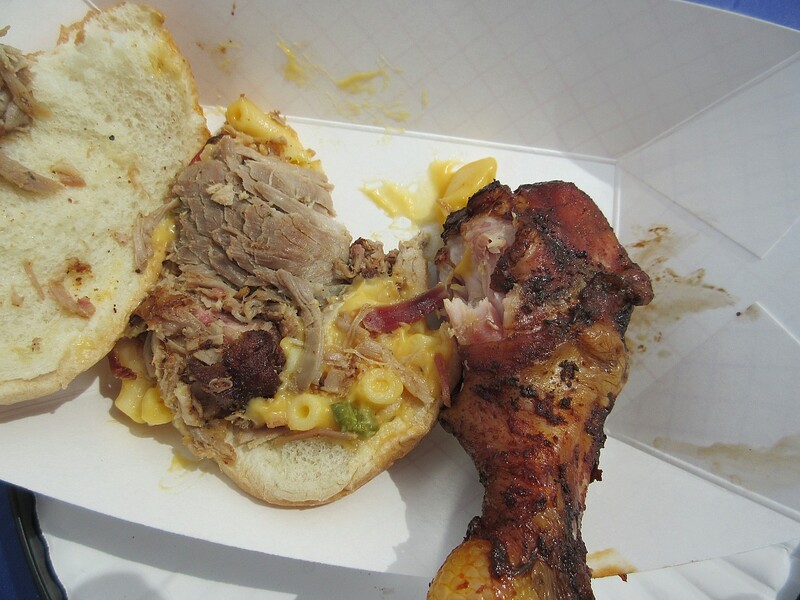 One of the more unique entries was a brisket mac and cheese sandwich. The concept is solid even if the result was not. I'd like to see someone with better brisket and mac take that idea on. 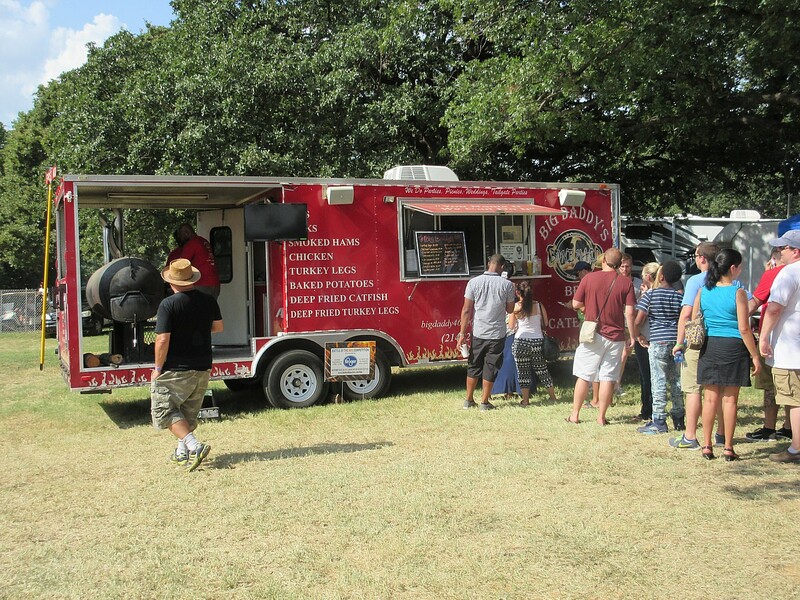 The second event was on Sunday and was billed as the Battle of the BBQ. It was similar to the event Saturday, only this time the contestants were the food vendors at the festival. This time there were far fewer players, 12 I think, which meant we had coupons left over. We simply went back and got more samples from our favorite. 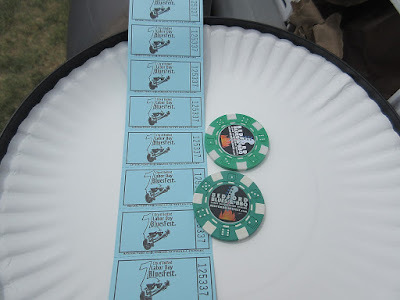 Once again, there was only one joint that had good smoke flavor and they got all 4 of our poker chips. The funny thing is I talked to some of the judges from the KCBS event and they said they were actually short of judges this year. It seems they skipped the usual BBQ judging classes this year and instead held steak judging classes.